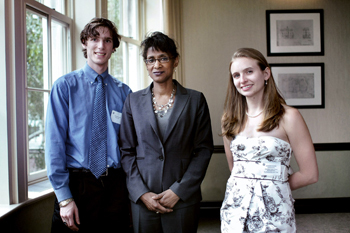 Dean Michele Moody-Adams joined valedictorian Arianne Richard ’10 and salutatorian Jeffrey Spear ’10 at the annual Academic Awards and Prizes Ceremony. PHOTO: TINA GAO ’10 BARNARDThe Academic Awards and Prizes Ceremony, at which students are recognized for their academic achievements, is a highlight of graduation week. Dean of the College Michele Moody-Adams and Dean of Academic Affairs Kathryn B. Yatrakis were on hand to congratulate the students at the ceremony, held on May 17 at Faculty House. Yatrakis, along with several noted faculty members, presented the awards. Following are the 2010 recipients.